Good news (for us at least): our new book is done! It’s called Think Like a Freak. It will be published on May 13; but you can pre-order now on Amazon.com , B&N.com, iTunes, or any of your finer online bookshops. The first two books were rarely prescriptive. For the most part, we simply used data to tell stories we found interesting, shining a light on parts of society that often lay in shadow. This book steps out of the shadows and tries to offer some advice that may occasionally be useful, whether you are interested in minor lifehacks or major global reforms. It strikes us that in recent years, the idea has arisen that there is a “right” way to think about solving a given problem and of course a “wrong” way too. This inevitably leads to a lot of shouting—and, sadly, a lot of unsolved problems. Can this situation be improved upon? We hope so. We’d like to bury the idea that there’s a right way and a wrong way, a smart way and a foolish way, a red way and a blue way. The modern world demands that we all think a bit more productively, more creatively, more rationally; that we think from a different angle, with a different set of muscles, with a different set of expectations; that we think with neither fear nor favor, with neither blind optimism nor sour skepticism. That we think like—ahem—a Freak. You can get the flavor of the book by checking out the Table of Contents, below. We can’t wait for you to read the book, and tell us what you think. On our “Upcoming Appearances” page, you can find the details of our U.S. and U.K. book tours (come say hello if we visit your city), as well as media appearances (like the Reddit.com AMA I’ll be doing on May 12). Once the book is out, we’ll start offering free signed bookplates so you can turn your standard-issue Think Like a Freak into an autographed edition. 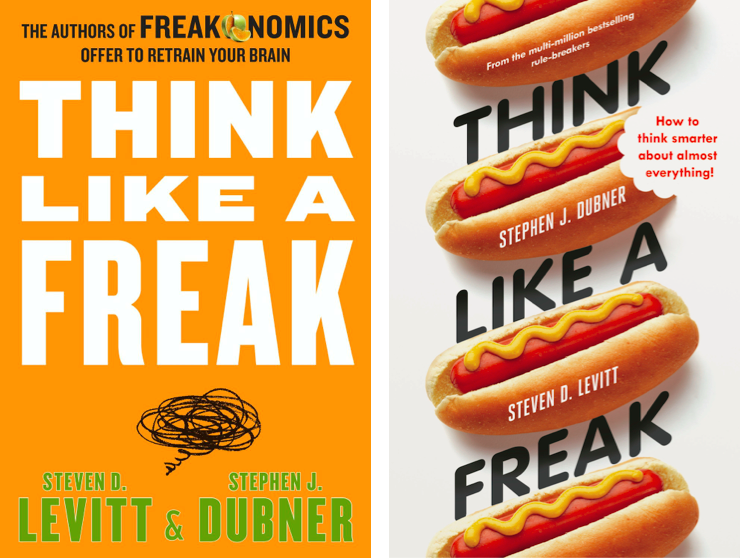 And keep your ear out for Freakonomics Radio episodes based on our favorite stories from Think, as well as a Think Like a Freak Book Club, in which Levitt and I will answer your questions about the book — and teach you, if you’re willing, to think like a Freak. Why is “I don’t know” so hard to say? . . . Sure, kids make up answers but why do we? . . . Who believes in the devil? . . . And who believes 9/11 was an inside job? . . . “Entrepreneurs of error” . . . Why measuring cause-and-effect is so hard . . . The folly of prediction . . . Are your predictions better than a dart-throwing chimp? . . . The Internet’s economic impact will be “no greater than the fax machine’s” . . . “Ultracrepidarianism” . . . The cost of pretending to know more than you do . . . How should bad predictions be punished? . . . The Romanian witch hunt . . . The first step in solving problems: put away your moral compass . . . Why suicide rises with quality of life— and how little we know about suicide . . . Feedback is the key to all learning . . . How bad were the first loaves of bread? . . . Don’t leave experimentation to the scientists . . . Does more expensive wine taste better? Why a bucket of cash will not cure poverty and a planeload of food will not cure famine . . . How to find the root cause of a problem . . . Revisiting the abortion-crime link . . . What does Martin Luther have to do with the German economy? . . . How the “Scramble for Africa” created lasting strife . . . Why did slave traders lick the skin of the slaves they bought? . . . Medicine vs. folklore . . . Consider the ulcer . . . The first blockbuster drugs . . . Why did the young doctor swallow a batch of dangerous bacteria? . . . Talk about gastric upset! . . . The universe that lives in our gut . . . The power of poop. It’s the incentives, stupid! . . . A girl, a bag of candy, and a toilet . . . What financial incentives can and can’t do . . . The giant milk necklace . . . Cash for grades . . . With financial incentives, size matters . . . How to determine someone’s true incentives . . . Riding the herd mentality . . . Why are moral incentives so weak? . . . Let’s steal some petrified wood! . . . One of the most radical ideas in the history of philanthropy . . . “The most dysfunctional $300 billion industry in the world” . . . A one-night stand for charitable donors . . . How to change the frame of a relationship . . . Ping-Pong diplomacy and selling shoes . . . “You guys are just the best!” . . . The customer is a human wallet . . . When incentives backfire . . . The “cobra effect” . . . Why treating people with decency is a good idea. A pair of nice, Jewish, game-theory-loving boys . . . “Fetch me a sword!” . . . What the brown M&M’s were really about . . . Teach your garden to weed itself . . . Did medieval “ordeals” of boiling water really work? . . . You too can play God once in a while . . . Why are college applications so much longer than job applications? . . . Zappos and “The Offer” . . . The secret bullet factory’s warm-beer alarm . . . Why do Nigerian scammers say they are from Nigeria? . . . The cost of false alarms and other false positives . . . Will all the gullible people please come forward? . . . How to trick a terrorist into letting you know he’s a terrorist. Winston Churchill was right—and wrong . . . The sunk cost fallacy and opportunity cost . . . You can’t solve tomorrow’s problem if you won’t abandon today’s dud . . . Celebrating failure with a party and cake . . . Why the flagship Chinese store did not open on time . . . Were the Challenger’s O-rings bound to fail? . . . Learn how you might fail without going to the trouble of failing . . . The $1 million question: “when to struggle and when to quit” . . . Would you let a coin toss decide your future? . . . “Should I quit the Mormon faith?” . . . Growing a beard will not make you happy . . . But ditching your girlfriend might . . . Why Dubner and Levitt are so fond of quitting . . . This whole book was about “letting go” . . . And now it’s your turn. This looks like another great book - I can't wait to read it! Thanks! You are too kind; fine first name, too. I'm curious about the hot dogs on the UK cover. What's up with that? Ah, thanks. Hey, what about my first name?! Oops. Yes, also an excellent first name. Will there be an illustrated version (like Super Freakonomics)? Perhaps but no definite plan. Why did I know that the left was the American and the right was the U.K. versions? How many others could just tell from looking? Care to investigate that on this blog? 'Tis true: British publishers have a *very* different sensibility than American. Very curious to read the part about quitting the Mormon faith! I am super excited for this next book, and oddly I HATE reading, but I can never put these books down!!! What no, "name the book" game? Ok, I pick D. Think Like a FreakThink Like a FreakThink Like a Freak. Can you put it on Amazon.co.uk so the Non Americans can read it please? Strangely it will be published in German on that site but not English! I cannot wait for this! Will you have a audiobook version? and if so will it be released at the same time? « Previous PostWhy Does Airport Pickup Cost More?